Elan Homes has made new senior appointments in support of its growth and expansion plans. 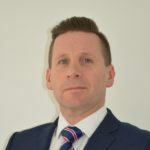 The new role of Strategic Land Director for the Elan group will be filled by John Beardsall (pictured), while Shaun McCarthy has been promoted from Technical Director for the Northern region to the new position of Group Technical Director. The company will consider development sites up to 10 hectares in size, although the new strategic division is also working on sites much larger than this nationwide. In line with Elan’s business plan, the focus is on traditionally built open market developments providing family housing with a minimum GDV of circa £5m.